the conversion of blood from a free-flowing liquid to a semisolid gel. Although clotting can occur within an intact blood vessel, the process usually starts with tissue damage. Within seconds of injury to the vessel wall, platelets adhere to the site. 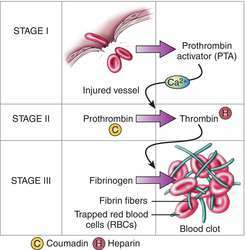 If normal amounts of calcium, platelets, and tissue factors are present, prothrombin is converted to thrombin. Thrombin acts as a catalyst for the conversion of fibrinogen to a mesh of insoluble fibrin, in which all the formed elements are immobilized. Also called blood coagulation or thrombus formation. Compare hemostasis. See also anticoagulant, coagulation. Process in which platelets, in conjunction with clotting factors, transform blood from a liquid into a semisolid mass. The cascaded sequence of changes which occur when blood comes in contact with damaged tissue and which culminates in the production of a solid seal in the damaged vessel. At least 13 factors are consecutively involved in a process that culminates in the conversion of the protein fibrinogen to the fibrin that forms the main constituent of the clot. This last stage is catalyzed by the enzyme thrombin. The smooth endothelial lining of the blood vessels normally prevents clotting within the circulation, but damage to this lining may allow THROMBOSIS to occur. Fig. 73 Blood clotting . 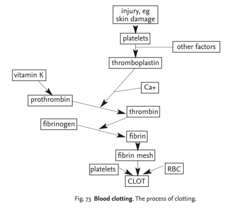 The process of clotting. damage to the blood circulatory system causes both BLOOD PLATELETS and the BLOOD VESSELS to secrete thromboplastin (see HAEMOPHILIA). thromboplastin, in the presence of calcium ions, causes prothrombin (a globulin type of plasma protein produced in the liver when vitamin K is present) to change to thrombin (see ANTICOAGULANT). thrombin acts as an ENZYME, causing FIBRINOGEN (another type of plasma protein) to be changed to fibrin which, when it contracts, forms a mesh of fibres in which blood cells become trapped. The final result of clotting is a hard lump which can plug the damaged area (if not too large) thus preventing further loss of blood and entry of microorganisms from outside. The proposed methodology and the electronic implementation of such methodology were to provide savings to the State by reducing reimbursement payments for blood clotting factor by approximately 5-10%. The State has refused to release information on how they have calculated the new reimbursement rates and the plaintiffs have alleged that based on the little information that is known, it appears that the State has made errors in their calculations which reflect an understating and misunderstanding of what home care companies must pay manufacturers for blood clotting factor. Vance Nielsen compared Hextend's ability to support blood clotting with other commercially used plasma volume expanders. Factor IX is one of the critical factors in the blood clotting cascade, and Factor Ixai selectively inhibits blood clot formation in blood vessels with minimal impairment of the normal protective mechanism that prevents blood loss from a damaged blood vessel. The Venom-Time Reagent expands Biopool's wide range of reagents and test kits used for the detection and diagnosis of blood clotting disorders. The discovery that PCA can prevent blood clotting with decreased potential for bleeding may represent an important breakthrough for the treatment of severe heart disease," said Lawrence L.
NASDAQ:ARRS) and Pharmacia AB (NASDAQ:PHARY) Tuesday jointly announced that they have entered into a research and development collaboration to pursue oral therapeutic products for blood clotting disorders.